Do not read this, listen to it. Besides the veritable buffet of Hollywood A-listers from various ethnic backgrounds providing narrations, there's beautiful music and songs in the interludes between stories and in the stories themselves. I've derived much enjoyment from the imaginative and enthusiastic performances from the narrators, most of whom possess great skills with accents. Even if you don't recognise a couple of the narrators' names, odds are you'd recognise their faces. Whoopi Goldberg and Hugh Jackman's performances were outstanding though most were above average.Urban legends, origin stories, fables, parables, myths, magic, time travel, African versions of well-known fairy tales, clever and devious characters, and emotionally touching stories - what more could you want?Well, the publisher has donated 100% of its takings from the audio to Nelson Mandela Children's Fund and Artists for New South Africa who work with children affected by HIV/AIDS.Introduction - Desmond Tutu★★★☆☆ The Ring of the King (Mythical African kingdom) - Alan Rickman Slightly iffy narration. Very clever story. I laughed at the end.★★★★☆ Asmodeus and the Bottler of Djinns (South African English) - Whoopi GoldbergExcellent and highly enjoyable narration. Another clever story. ★★★★★ Mpipidi and the Motlopi Tree (Botswana) - Matt DamonBeautiful singing. Heartwarming story of a boy who finds and takes care of an abandoned baby girl.★★★☆☆ Natiki (Namaqualand, South Africa) - Parminder NagraAn African version of Cinderella.★★☆☆☆ The Mantis and the Moon (San, South Africa) - Forest WhitakerA mantis tries to capture the moon.★★☆☆☆ How Hlakanyana Outwitted the Monster (Nguni, South Africa) - Sean HayesHow Hlakanyana outwitted the hare was more interesting than him outwitting the monster.★★☆☆☆ The Message (Namibia) - Charlize TheronGreed leads to the garbling of a message of comfort and hope into one that compounds grief and desolation.★★★☆☆ The Wolf Queen (Cape Malay) - Benjamin BrattA girl requests a silver dress, then a gold one, then a diamond dress to put off having to reject the sultan's marriage proposal as she was already in love with another. She eventually shapeshifts with the help of a wolfskin.★★★☆☆ The Snake Chief (West Africa/Zululand, South Africa) - Scarlet JohanssonNever make bargains you don't intend to fulfil, especially if it involves gifting a family member to a stranger, the snake. Luckily it was a Frog Prince story - the snake turns into a human because a virtuous girl had accepted him.★★★★☆ King Lion's Gifts (Khoi, Southern Africa) - Ricardo Chavira How the animals came to look and sound the way they do. The King Lion bestowed gifts such as suits and laughs upon them.★★☆☆☆ Words As Sweet As Honey from Sankhambi (Venda, South Africa) - Debra MessingHow monkeys gained their muscular physique.★★★☆☆ Sakunaka, the Handsome Young Man (Zimbabwe) - LeTanya Richardson JacksonGreat narrator. A selfish mother depriving her son of a wife for fear of losing him to another woman. Sad that the mother had to die. Why couldn't she live with or near her son after he'd married?★★★★☆ Wolf and Jackal and the Barrel of Butter (Cape Dutch) - Hugh Jackman Awesome narration. Poor wolf didn't know he'd been hoodwinked by the Jackal.★★★★☆ The Guardian of the Pool (Central Africa/Zululand, South Africa) - Gillian AndersonA daughter uses her mother's multiple sacrifices to keep her child alive to give her the strength to take a risk to save her mother's life. Another Frog Prince story.★★★☆☆ Sannie Langtand and the Visitor (South African English) - C.C.H. PounderExcellent narration. Time travel. Dragonflight. Flying carpets.★★★★☆ The Sultan's Daughter (Cape Malay) - Blair Underwood Excellent narrator. Lovely story and moral; doing a kindness when there is no chance of reward. ★★★☆☆ Van Hunks and the Devil (Cape Dutch) - LeVar Burton Urban legend explaining why there's smoke around Table Mountain.★★☆☆☆ The Clever Snake Charmer (Morocco) - Samuel L. Jackson Great narration. Not as clever as I'd hoped, except for the tiny donkey. He just gives vague answers to riddles and questions posed by the king.★★☆☆☆ The Enchanting Song of the Magical Bird (Tanzania) - Jurnee SmullettChildren sometimes see and hear truths where adults hear only lies.★★☆☆☆ The Hare and the Tree Spirit (Xhosa, South Africa) - Sophie Okenado A girl is struck dumb after unknowingly she was cursed by an old woman who'd tripped over the girl's rubbish. A hare hoodwinks a man into providing him fresh green meals, until he feels guilty and makes good on the deal he made by helping the girl regain her voice.★★★★☆ The Mother Who Turned to Dust (Malawi) - Helen Mirren A unique human origin story.★★★★☆ Fesito Goes to Market (Uganda) - Don CheadleTelling the difference between those who take advantage of you and those who genuinely need help, and overcoming great difficulty to succeed. Great narration.Niggling downsides to the audio are: narrators are not introduced nor is the origin of the each tale, the stories are in a radically different order to the paperback and not all of the stories in the paperback are bundled into the audio. Ten are missing, five of which can be found on Audible for which I paid an extra £7:★★★★☆ The Cat Who Came Indoors (Zimbabwe) - Helen MirrenEven if you're not a cat lover, you'll like this origin story of the cat-human relationship.★★★★☆ The Lion, the Hare, and the Hyena (Kenya) - Alan RickmanDon't try to break up a relationship in order to befriend one of your victims, it could turn out badly for you.★★★☆☆ Spider and the Crows (Nigeria) - Don CheadleGreed can make friends into enemies and leave you rich but without allies.★★★☆☆ Mmadipetsane (Lesotho) - Alfre WoodardExcellent narration. A disobedient girl dances with danger by encroaching on a monster's territory despite warnings from her mother, until her luck runs out.★☆☆☆☆ The Cloud Princess (Swaziland) - Matt DamonStockholm Syndrome. Princess wants to marry her captor. He follows her back to her kingdom where the king tries several times to have him murdered until he decides to return to his home. The princess follows and their gifted with a village of people who worship them.The others found only in the paperback are:➛ The Great Thirst (San, South Africa)➛ Mmutla and Phiri (Botswana)➛ Kamiyo of the River (Transkei, South Africa)➛ The Snake with the Seven Heads (Xhosa, South Africa)➛ The Hare's Revenge (Zambia)*Read as part of The Dead Writers Society's Around the World challenge. The folktales are wonderful narrative representations from many African countries including South Africa. The prize however is the audiobook loaded with many talented narrators/actors (Gillian Anderson, Benjamin Bratt, Don Cheadle, Matt Damon, Whoopi Goldberg, Sean Hayes, Samuel L. Jackson, LaTanya Richardson Jackson, Debra Messing, Helen Mirren, Parminder Nagra, Sophie Okonedo, CCH Pounder, Alan Rickman, Jurnee Smollett, Charlize Theron, Blair Underwood, Forest Whitaker, and Alfre Woodard). Most do a very good job with the reading and characterizations. Some, however, do an outstanding job, while a few narrators inadvertently transport the African stories to Europe or South America, and yet the stories still work. A worthwhile listen. Piccole storie di vita e di cibo.Questo libro di fiabe africane è un piccolo preziosissimo dono che Nelson Mandela ci fa a fianco del dono molto più grande per cui è famoso.Le storie seguono una struttura molto simile rispetto alle favole tradizionali che la tradizione ci ha consegnato: l'antropomorfizzazione degli animali, il forte carattere educativo e moraleggiante, lo stile e l'immaginario molto semplici e lineari.Ma proprio questa apparente somiglianza in realtà sottolinea i punti di distacco, che sono quelli dove lo spirito dell' Africa nera emerge con la sua travolgente e primitiva vitalità. Sono storie di una umanità non ancora inquinata dalla socialità complessa degli stati occidentali, e dove i bisogni e le necessità sono ancora di tipo primitivo. Nella versione africana di Cenerentola la protagonista vive in un villaggio, raccoglie erbe e tiene acceso il fuoco, mentre il principe in realtà è un cacciatore il cui fascino principale sta nel riuscire a tener sempre piene di carne le ciotole. Caccia, pesca, raccolta: il cibo la fa da padrone in tutte queste favole, a testimonianza di una cultura che ancora non dà per scontata la sopravvivenza: che proprio per questo non è capace di intristire il suo spirito con vuote elucubrazioni. Le storie d'amore sono genuine e lineari, quasi sempre a lieto fine ma molto poco confortanti. Il racconto di una vita dura ma semplice, con risposte scomode ma comprensibili: questo arriva agli occhi del lettore occidentale di queste favole.E forse è quello di cui molti lettori hanno bisogno, le orecchie piene del tormento spirituale di cui molta della narrativa dei paesi evoluti è piena. Pare di vedere il piccolo bimbetto bianco e sovrappeso, correre con gli occhi lucidi di lacrime a chiedere una storia al vecchio schiavo, i piedi ancora impolverati e legati da catene, e quello seduto a terra anzichè rivoltarsi sorride, alza lo sguardo e comincia a raccontare...raccontare di come forse la felicità sta non nell'avere delle risposte ma nel farsi domande giuste, semplici e che portino ad apprezzare il poco che si ha.L'immaginario è potentissimo: l'Africa è ancora oggi un continente a tinte forti, violenta e selvaggia in tutte le sue manifestazioni. Non poteva essere diffferente il folklore che produce. E' anche molto ricco e variegato il panorama che esse tratteggiano: Madiba ha fatto un lavoro degno della sua potente mente politica nello scegliere queste storie in modo che restituiscano tutto il complesso e stratificato scenario della cultura africana di fine millennio. Sono presenti storie di tutte le etnie Zulu, contaminazioni introdotte dai colonizzatori boeri prima ed inglesi poi, per arrivare persino a storie di tradizione arabo-islamica (squisitamente simili alle mille e una notte) introdotte dalla comunità bengalese di Città del Capo, deportata in tempi remoti dalla loro madre patria. E non è certo un caso che il machiavellico vincitore sull'apartheid abbia scelto quasi sempre versioni trascritte e rivedute da antropologi bianchi, quasi sempre di origine olandese.Ma leggendo queste fiabe non viene voglia di parlare di politica, siamo lontano dalle dichiarazioni di poetica polemiche di un Fedro alla ricerca di gloria e compensi: e queste favole non nascono per imitazione pedissequa da paradigmi grecizzanti, ma dal pianto dei bambini.Il lettore di "le mie fiabe africane" è in cerca di conforto e di sicurezza, un po' come quel piccolo bambino nudo zulu che chiese a Nelson Mandela di far scrivere la sua storia altrimenti nessuno la avrebbe imparata: e leggendo di Mpipidi e dell'albero Motlopi, siamo anche noi un po' insieme a quel bambino a ricevere la carezza di quel vecchio sorridente, coi piedi ormai liberi dalle catene, che la storia chiamerà vincitore. It has been a long time since I have been read to by adult. It was a true pleasure being read to by the familiar, expressive voices of famous actors, such as Whoopi Goldberg, Blair Underwood, Sean Hayes, Matt Damon, Benjamin Bratt, LaVar Burton, Hugh Jackman, Samuel L. Jackson, and the list goes on and on. Each story ranges anywhere from four minutes to eighteen minutes, so it is easy to listen to the three CD's in short spurts. Some of the stories are more interesting than others, the majority of which I think would be most appreciated by fourth graders up through adults, mostly because of the vocabulary and how quickly some of the actors read. A few of my favorites were: “The Sultan’s Daughter,” “The Wolf and Jackal and the Barrel of Butter,” “The Mother Who Turned to Dust,” “The Clever Snake Charmer,” and “The Wolf Queen.” There are also very brief musical interludes that help transport the listener to a more relaxed and rhythmic state of mind. For younger children (or tired adults) it is a great bedtime CD. As if you don’t already have a good reason to go out and purchase this CD for your home or classroom, the proceeds go to a few charitable, humanitarian organizations: Artists for a New South Africa (ANSA) and the Nelson Mandela Children’s Fund (NMCF). Both organizations are involved in efforts to help children in South Africa orphaned and impacted by HIV/AIDS. You get three hours of total playing time for only $17.00. The pictures shown on the CD jacket are authentic, cultural works of art. The introduction spoken by Archbishop Desmond Tuto gets the listener’s attention right off the bat. The music is by Johnny Clegg and Vusi Mahlasela and the whole experience was directed by Alfre Woodard. By the end of the three hours (spread out over many days), I had the same content smile on my face as the sloth pictured on the back cover. An enjoyable escape and sleeping children… what more could a middle-aged mother want? Who wants to borrow it first??? This book was a GR recommendation and one that we had to request the local library to order. What attracted me to this book was Nelson Mandela first of all since he was such a great person and second of all the learning of African mythoi as there aren't many who cover the subject while with as much different ethnic and cultural groups it would be hard to find a book that can be all-inclusive of each single group found in Africa. The special thing about this book is that although it isn't all-inclusive it does cover the majority of South Africa, which has its own massive collection of groups and history. And even though the book is dedicated to preserving African mythoi it follows Mandela's views of acceptance by joining the African history with its colonial history of both the Dutch and the Malay inhabitants that came to call this place home. Each story is told by a different person and illustrated by yet another so the book isn't only just a collection of the folktales combined from so many sources but shares that characteristic in its presence. The unique storytelling catches the reader with some standing out more so than others and the illustrations like wise so that there is something for everyone. If the book wasn't so big and awkward in size I would say it is the perfect book for sharing and learning. All in all it is a great stepping stone for those who want to learn how to be a storyteller or learning the basics of cultural South Africa. A definite recommend to those who may be interested. What a wonderful audiobook! Many times, I feel disadvantaged by having to listen rather than read a book, but this book was a wonderful exception. The stories are all read by famous actors and actresses and there are the most beautiful songs accompanying the stories. My favorite reader was Alan Rickman. I adore his voice. I purchased the book from iTunes and it included a digital booklet with the illustrations for each story. The illustrations are also beautiful.I've listened to many of these with Oscar, but I also had to listen to it on my own. The book includes about 25 short stories. I really enjoyed The Mantis and the Moon from the San, and Fesito goes to Market from Uganda. Frankly, I have my doubt exactly how much editorial input Nelson Mandela had in this book. I also have my doubts exactly how old some of these "folktales" are ... but then, I'm not sure how old a story has to be, to qualify as a folktale. Hmm.Nevertheless, the audio version gets points for celebrity glitteritude. The stories are narrated by: Gillian Anderson, Benjamin Bratt, LeVar Burton, Ricardo Chavira, Don Cheadle, Matt Damon, Whoopi Goldberg, Sean Hayes, Hugh Jackman, Samuel L. Jackson, LaTanya Richardson Jackson, Scarlett Johansson, Debra Messing, Helen Mirren, Parminder Nagra, Sophie Okonedo, CCH Pounder, Alan Rickman, Jurnee Smollett, Charlize Theron, Blair Underwood, Forest Whitaker and Alfre Woodard. So that's fun. This audio anthology of folktales is one of the best things I've listened to all year. I really loved all the different narrators, and the plentiful music. I also liked that the stories didn't last too long, so if you zone out for a minute to pay attention to driving you don't have to wait very long to catch the beginning of a new story.I found it really interesting how different the stories were from what I imagined "African folk tales" to be. There are slightly more modern ones and ones that are heavily Muslim - influenced, and ones that I could have sworn I'd heard before in a European context. Fascinating. This is a great collection of African folktales with such beautiful illustrations!In the beginning of the book, there is a map of Africa with a number key so that you can match each story to its African country of origin.There are all sorts of stories contained within this book from creation stories to moral tales to stories of how certain animals came to look the way they do (spots, stripes, horns etc. ).I became interested in African folktales after I began reading Alexander McCall Smith's No.1 Ladies Detective Agency series in which certain well known African tales are always slipped in to the stories.I am very pleased with this book and will refer to it again and again. A lovely mix of folklore, creation stories, and fables from all over Africa, preserved and retold. Some of the stories lend themselves better to a more dynamic reading, and those are the most successful ones in this format; likewise, some of the actors are (much) better readers than others, but since they all donated their talents to this charity project, it seems petty to quibble. At their best, the stories are funny and magical, brought to vivid life by the narration (CCH Pounder was a standout) and snippets of authentic, joyful music. Great family listening, for a great cause. It was an easy listening about 3.5 hours. I loved listening to the audiobook and I suggest you get the audio version which had some interesting celebrities narrating each short tale. It’s a wonderful collection of African folk stories reminded me of the stories that I grew up listening to. Rest in peace Mandela. You will be missed! This would be a great book for children. I enjoyed the stories from a cultural perspective, more so than from a moralistic one. Obviously, the problem being that I'm a little too old for childish preaching. But, I would love to read this book to my children someday. Enjoyable although some folktales are a bit rough. May not be suitable for young children. 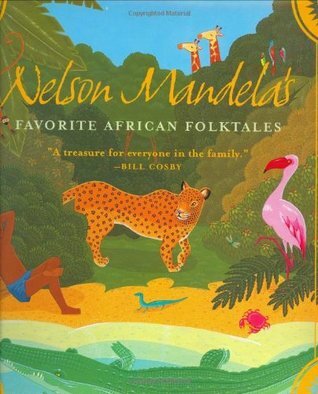 Nelson Mandela's Favorite African Folktales is a great compilation of stories and illustrations. What stood out to me the most in this book is the imagery. For example, in the story of The Enchanting Song of the Magical Bird it says "...the rushing of its great wings as it came to perch in the crown of the old yellowwood tree, under its thick canopy of leaves." and in the story titled The Guardian of the Pool, it reads "That night, as a full moon rose blood-red above the mountains, Python uncoiled his silver body and slowly rose to the top of the pool". Examples like this show that this book would be great for teaching students about imagery, simile, metaphor, etc. I also like that this book consists of so many stories (32!) because it gives a great opportunity to study the book as a whole, but allow students to work individually or in groups to dive into specific folktales. Additionally, the book includes a map of Africa that shows where each story is believed to have originated. What a great way to combine geography and art (not to mention the Nelson Mandela link for social studies!). Award: NoneGrade Level: 3-6Summary:This is a collection of folktale including "The Message". This particular folktale is about a message that moon gave to tick to tell the people of Kraal. Tick was very lazy and took a really long time to get to Kraal to deliver the message. He ran into Hare and told him the message; Hare wanting to be recognized raced to Kraal to deliver the message. By the time he got to Kraal he forgot the original message and gave the people the wrong message. Moon found out and was really upset. Moon and Hare got into a fight and Moon caused Hare to have a cleft palate and Hare smack moon in the face with ashes which is why the moon is still that color today.Review:I think this folktale is a interesting. It is a little absurd which makes it funny. I think it could teach children a lot.Uses:We could play the telephone game where the teacher starts with a message and the children have to whisper that message to other students in the room and see if the message changes at any point. If it does the teacher can reassure the children that if they are unsure of something that was said it is okay to ask.Another use could be just for fun. Audiobooks are not usually my thing, but I think that's how I should have experienced this book. These stories were really meant to be told/heard aloud, and it felt like something was lost trying to capture them in text. I liked that each story was preceded by a snippet of geographical and/or historical context, but I really wanted to know more about where each story came from -- which was obviously beyond the scope of this book, but also felt like something that was missing as I read the stories without enough context to fully appreciate them. I'll give the audiobook a try! So many wonderful stories from across the best continent of Africa. Many (most) are from the southern part, as you would expect considering that Nelson Mandela was choosing his favorites. "The Wolf Queen" in particular stood out in my mind, since it showed once again that the Cinderella trope moves far beyond Europe. Definitely worth reading for lovers of folktales, people curious about African stories, or who wonder about the tastes of one of the greatest figures in modern history. A collection compiled by Mandela of folktales from various African nations. Generally they’re from southern countries but there are a few that are from eastern or western nations. I liked that each one indicates where it came from and a theme for the story. It made it more enjoyable for me and enabled me to get a sense of the various nations. Many of the stories are around a trickster theme, popular to the folktales format. I highly recommend listening to the audio book. Each story is narrated by a different wonderful actor or actress, and they really lend their talent to the stories. What I personally enjoyed even more were the songs throughout the stories, and collected at the end. The folktales themselves were fun and delightful. It was absolutely wonderful. Don't read this book - listen to it. Do you enjoy audiobooks with celebrity narrators? Imagine a bunch of short stories, each with a different famous narrator. The stories themselves are good, too. African folktales in US popular culture are certainly nowhere near as well known as European/Grimm folktales, so it was nice to hear some unfamiliar tales with morals that are just as meaningful. This was an uneven collection with an uneven set of audiobook readers. There were a couple stories I really enjoyed a lot though. Wasn't sure what the moral of some of the stories were, but entertaining nonetheless. The music was fantastic as well. I listened to the Audiobook. I liked the different readers. They were all great and really into the characters. The stories were memorable, funny, and moral. Amazing! Listen to the audio version. A star-studded cast of readers (including LeVar Burton!) with music by S. African legends. I highly recommend the audiobook for this! Each story is narrated by a different celebrity, and hearing the different narration styles was very fun. This was a delightful book to share with my son and such a lucky thrift store find for us. I really like how each tale begins with a brief description of the story's origins and cultural importance. I also appreciated the fact that each illustrator was named in the description, not just the author retelling the story, because as we progressed through the book my son was eager to jump ahead and see the illustration paired with each one. It was a joy to watch him study each image -- it was like watching imagination brewing. For the most part we both enjoyed the collection of stories. I think I enjoyed the stories in the second half of the book more so than those at the start. We took our time reading these - even pausing for some time while we moved. So I was surprised when I asked my son which was his favorite story and he named the very first one in the collection. It gave me confirmation that they were so well-told that he remembered details about them months after having had them read aloud to him. For me that's the test of a good story; it's one that sticks with you long after the telling. So, my son's favorite tale was "The Enchanting Song of the Magical Bird." We both really enjoyed "The Mother Who Turned to Dust," which my son refers to as the story about the "mother moon." I thought it was a masterfully crafted story with a really unique perspective - that of how "Mother Earth" came to be and her view of her children on Earth. It opened up a great dialog with my kid about caring for our environment. Another story I really enjoyed was "The Mantis and the Moon" because it was fun to see what the Mantis would come up with next in his venture to capture the moon. But, so many of these stories were just such a pleasure to read aloud and I recommend taking the time to TELL these stories to your kids even if they are old enough to read the stories to themselves. Van Hanks and the Devil and Asmodeus and the Bottler of Djinns were great to read aloud. I appreciated the lessons imparted by "The Ring of the King' which touches on having a guilty conscience and "Fesito Goes to Market" which demonstrates the pride of having good character. There is only one story I regretted reading to my son, only because I read it to him right before bedtime. It was a tale about a monster that ate a foolish child. There wasn't anything per se awful about the tale, its just that had I had any familiarity with the story I would not have chosen it as a bedtime story!Overall, I'm really happy to have stumbled across this book and look forward to keeping it as a permanent part of our collection of children's stories from around the world. I absolutely loved Nelson Mandela’s favorite African Folk tales. I found this book to be very interesting and hilarious. I loved this book so much because I was able to read many folk tales in one book. As a child I don’t remember having the opportunity to hear or learn about many folk tales. I think this is a genre that can defiantly keep children interested in literature. I say that because many of the stories are filled with animals that have human characteristics as well as imagination. These stories also try to explain how things came to be which is interesting, because folk tales can help individuals who are not of a certain culture to understand that culture better.A particular favorite that I read in this book was the Great Thirst. This is a folk tale that originated in Africa. In this folk tale the story seeks to explain how water, grass and fruit tress came to be. The story also seeks to explain why there are some animals that hunt for blood and meat and others do not. The story began with there being no water or food for the animals on earth to eat. In that case they had to eat each other, and drink each other’s blood in order to survive. But Elephant who the story refers to as “the great one” said he could no longer go on like that. He wished that he would die in order to benefit all of the animals. He wished that he would die so that his bones would become fruit trees, his sinews would become tendrils that bear tsamma melons and his hair would become grassy fields. Upon hearing this the other animals began to ask Elephant when will this happen, because elephants live for a very long time. So snake decided he would help, and he bit elephant’s leg with his poisonous fangs until he died. In conclusion, Elephant kept his promise and his body provided food for the animals. But the animals who could not do without meat and blood crept away into the night and came out to hunt the other animals when they were sleeping. Also the folk tale explains that water came onto the earth through Snake. Snake went into a hole in the ground and hissed and blew until water came above ground. I think that this book is a 6th grade reading level. This book contains a lot of advanced vocabulary and things about the world that younger children wouldn’t understand. I would use this story when discussing different genres to my students. I also think that this book as well as folk tales in general would be great for a social studies lesson. I would specifically use this book for a social studies lesson about the African culture. This audiobook is fabulous! Each folktale is read by a different actor. In between some of the stories and also at the end are wonderful African songs.